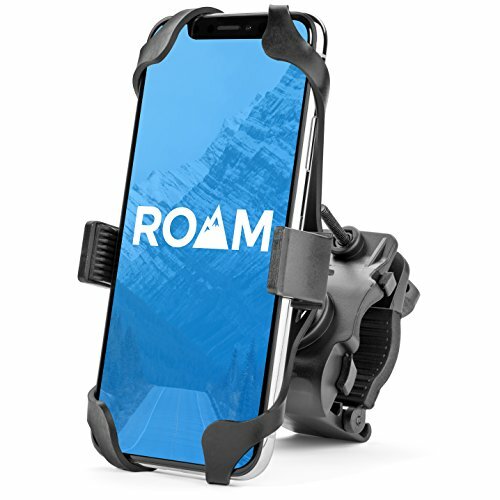 In case you are in the market for the best motorcycle phone mount, we’ll spare you some time and let you know that the product we chose is the Roam Universal Premium. 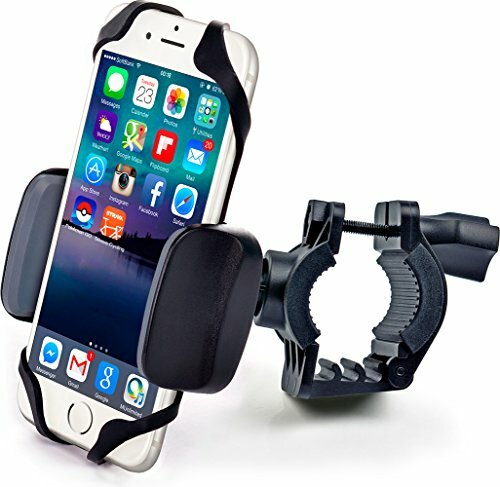 Of course, we did not just come up with this name out of nowhere, but we analyzed many products and went through a lot of motorcycle phone mount reviews to get to this item. The main reason we selected this one has to do with quality, versatility, and customer rating. First of all, this mount can hold mobile devices up to 3.5 inches wide. The size is adjustable, and it can fit handlebars from 7/8 to 1-1/4 inches in diameter, so there is a wide array of motorcycles and bicycles this can work on. But most importantly, due to the materials it is made from and its design, it will securely hold your phone in place. In case you cannot find or do not agree with our first suggestion, we recommend the CAW.CAR Accessories Cradle Holder as our second favorite. This option can be installed on any motorcycle or bicycle handlebars with diameters between 7/8 and 1-1/4 inches, as it is adjustable. It will hold any phone in place with a width of up to 3.5 inches. There are two points of contact which offer this unit a tight grip. Hard plastic and a silicone net were used for this item. Also, the very large clamp makes the product an adjustable and a versatile one. This product is not waterproof, and there were some issues reported from customers who got caught in the rain while having the mount installed. 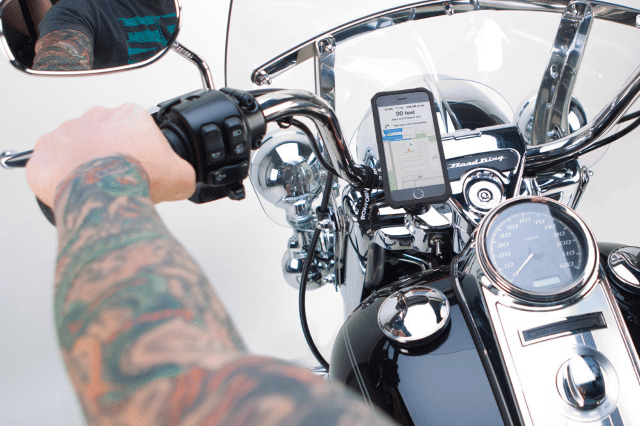 Keep your smart device in sight all the time, with this reliable motorcycle phone mount. 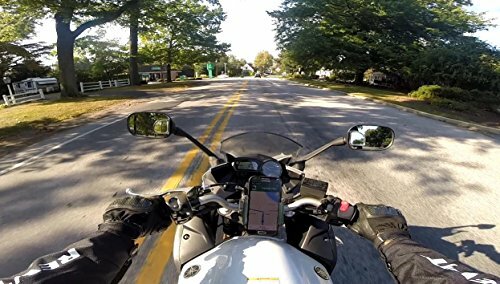 If you want to keep your mobile phone in sight even when riding, this motorcycle mount is a great alternative. You can install it on pretty much any type of tubular handlebars. The unit is suitable for devices up to 3.7 inches wide, and handlebars with diameters from 0.6 to 1.4 inches. No particular tools are needed to install this phone mount which is a very convenient aspect. Some customers showed their concerns mentioning that it does not feel sturdy enough, although few unfavorable cases were reported. You can install this phone mount on many types of tubular handlebars effortlessly. If you are looking for a multi-purpose option, this product will surely arouse your curiosity. You can use this mount on your motorcycle's tank and have a GPS and a mobile phone in sight while you are riding. The item comes with a protective base material that prevents slipping or markings. Besides the 2 pockets, there is an additional pouch where you can keep your keys or other small objects. Some owners would have liked the phone pouch to be larger. It seems it will not fit larger devices such as the Samsung Galaxy S6 or the Grand Prime. Your GPS, smartphone, and keys can be stored in sight with this smart phone mount. Searching for the right motorcycle phone mount can be a tedious task, mainly because you need to make sure your smartphone will not fly away while you are riding, so the product in question must be a reliable one. The market is full of expensive and cheap motorcycle phone mounts, but after a solid analysis, we managed to make a list of our favorite items you can find showcased below. 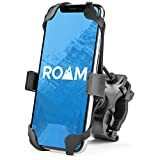 If you want to purchase a motorcycle phone mount, the Roam Universal Premium can be a good choice. It is designed to fit any mobile phone up the 3.5 inches wide securely, such as the iPhone 6s, the Samsung Galaxy S7, the OnePlus 3, the HTC 10, or many other models. The size of the unit is adjustable and can fit handlebar sizes from 7/8 to 1-1/4 inches in diameter, which makes it suitable for motorbikes or even bicycles. You should know that this product is not intended for supersport bikes with clip-on style handlebars, like crotch rockets. When it comes to its grip, this item uses two points of contact. The Co-pilot will mount your smartphone to the handlebars securely, thanks to a premium hard plastic grip with a silicone net. This way, each corner of your phone is secured tightly to the mount. In addition, the Co-Pilot comes equipped with the largest clamp on the market which can fit any size handlebar. When it comes to new purchases, only the most useful motorcycle accessories can do. 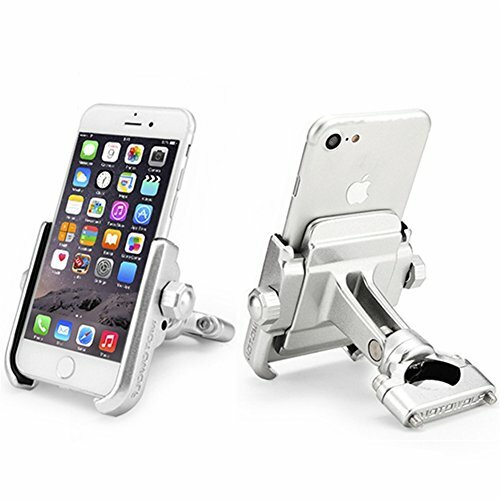 The phone mount offered by CAW.CAR Accessories is definitely a good option. It enables you to securely mount your phone to any type of motorcycle or bike with tubular handlebars. This holder is suitable for all devices up to 3.7 inches wide, and for all handlebars between 0.6 to 1.4 inches in diameter. Best of all, you don’t need any tools to install it. This product was designed with an adjustable grip with 360 degrees pf rotation freedom. All you need to do is adjust and secure your cell phone in any position or angle you prefer, with the rubberized ball and bracket design. Furthermore, the shock absorbing and extra secure rubberized clip with silicone belt holds your device firmly and safely. The corners of your phone are held in place with band wraps. You can enjoy the toughest race, and your device will not fall. If you are looking for high quality, but also for something practical, we suggest taking a look at the Nelson-Rigg CL-GPS-ST Journey Mate Strap Mount. It can be attached to the motorcycle’s tank with the strap mounts which come with a protective base material, in order to prevent marking or slipping. This product is equipped with a multi-position GPS pocket that fits most popular GPS or electronic devices, an additional clear pocket for your cell phone, and an audio pocket. Moreover, the clear pouches are touch-screen device friendly. It also features a convenient carry handle. The dimensions of the GPS pocket are 6×1.5×4.5 inches, the mobile phone’s 3.5x1x6 inches, and the audio one 2.75x1x6 inches. These measurements are suitable for many types of GPS or smartphone devices. The product is made from high-quality UV treated Tri-Max ballistic nylon. This item is very appreciated by most customers. Reliability and sturdiness are what describe this product from Tackform Solutions. The unit was made to outlast you, from 6061 machined aluminum, and the high strength industrial spring system provides a fail-proof grip on your mobile device. Best of all, this mount can be installed on a wide range of handlebars. It works with H-Bar, Trackers, Moto, Clip Ons, Zero Drag, Low Drag, High Drag, Zed, Maynard, Frisco, Champs, Mustache, Clubman, Keystone, Breezers, Window, and Ape Hangers. In case we forgot a name, most likely it still is compatible with it. Regarding dimensions, you get a 7/8-inch, 1-inch, 1.15-inch bushings included. Also, the clamp mounts straight to 1.25-inch bars without the bushing. The unit works with phones up to 3.25 inches wide. Furthermore, the aluminum ball and socket joint provide the ideal viewing angle on pretty much any bars. Also, you can easily remove your phone using only one hand. Many motorcycle phone mounts on the market are compatible with mobile devices of 3.25 or 3.50 in width. 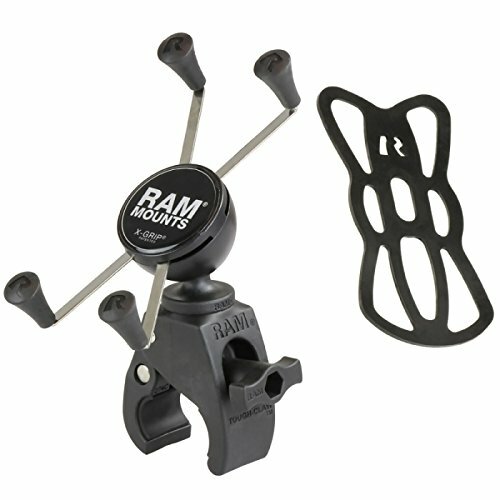 The RAM Tough-Claw Mount with Universal X-Grip allows you to use larger ones and even phablets. The X-Grip cradle comes with a distinct and smart four leg design that provides excellent holding power, without covering any parts of your phone with foam pads or plastic. It expands and contracts for a perfect fit for most types of smartphones. This product also allows a 360-degree rotation. It includes a device tether which is recommended for outdoor applications as well. Still, before you decide on this item, you should carefully check the dimensions. The clamping range for the rail surfaces should be between 0.625 to 1.5 inches. The clamping range for flat surfaces is from 0 to 1.14 inches. For the cradle, a minimum width of 1.75 inches is acceptable, and a maximum one of 4.5 inches with a minimum height of 3.25 inches. Surely when you are looking for a phone mount for your motorcycle, you want it to be reliable, and your mobile device to be kept safe. 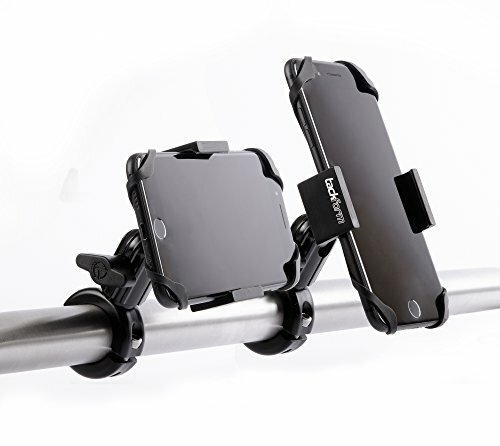 An option worth looking into is the ILM Motorcycle Phone Mount Premium Aluminum Universal Bike Handlebar Holder. This product fits large phones such as the iPhone X or the Samsung Galaxy S7 and other models that are up to 3.7 inches wide. It is a heavy-duty product that promises durability. Unlike other models in this line, there is no stretchy silicone for shock absorption, but the stainless steel and aluminum construction is less likely to snap or break at high speeds than a plastic clamp. 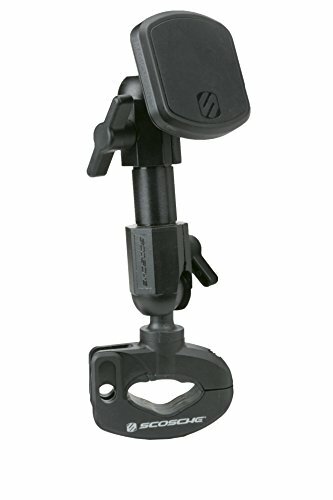 This phone mount was designed for Powersports, and it will hold your device firm and stable. Regarding handlebar compatibility, it is adjustable to fit sizes in the range of 3/4 to 1-3/8 inches in diameter. Another great feature is the 360-degree rotation with multi-adjustable viewing angles for your phone. 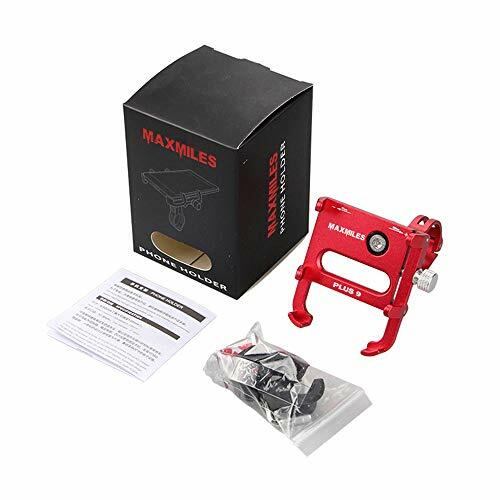 MaxMiles comes with a revolutionary product and promises that it is the strongest and most reliable phone holder on the market, which is very affordable as well. A significant feature is the fast use. All it takes is an easy movement in order to attach or detach your smartphone that can be between 2 and 4 inches wide. The installation process is simple as well, thanks to the adjustable clamp that is compatible with bars up to 31.8 mm in diameter. This unit is stable, reliable, and secure, as it comes with a powerful 3M adhesive patch. You will never have to worry about losing your cell phone. The high-quality is ensured by the premium, lightweight CNC-machined aluminum alloy it is made from. Furthermore, with the 360-degree rotation, you will easily find the position that works best for you. Basically, this is a motorcycle phone holder that is ready for anything you throw at it. If you are interested in a magnetic motorcycle phone mount as an option from this line of products we suggest keeping the Scosche PSM11017 model in mind. It fits round or square tubes in the range of 0.75 inches to 1.25 inches. This unit comes with small and large device plates with protective films. The Pro XL mount is equipped with a wide surface and with strong magnets to provide double the power of other older models, and it is also 100% safe for your mobile device. The rubber straps offer increased device security. The adjustable mount head and the base can swivel and rotate to 360 degrees so that you can find the position that best suits your needs. You should know that all the structural parts are made from 6061-T6 aerospace grade aluminum with a stainless steel mounting hardware, which offers this unit durability. Another advantage is that you get lifetime tech support and limited lifetime warranty for this item. When you decide to get the best motorcycle cell phone mount, there are many things to consider. First of all, you need to get a unit that is capable of keeping your mobile device safe. Otherwise, you might end up with a useless mount and no phone. The budget should also be considered when making such a purchase. Still, there are certain features you need to look for before actually buying the product. So, what makes a good motorcycle phone mount good? One of the most important aspects to consider is for the mount to be compatible with your mobile device. Usually, phone mounts are adjustable so they can fit more types with a variety of widths. So, the first thing you need to do is to check the range of dimensions that the product can hold. You have multiple options when looking for such an item. There are universal phone mounts that are designed to fit many smartphones, or there are those made specifically for various brands or even models. You can simply check the shape and size of your phone and buy the appropriate mount, or you can verify the sizing guide of the mobile device holder to learn more. Just as it is with motorcycle handlebar speakers, a phone mount has to be compatible with your bike’s handlebars, otherwise, it is useless. To be sure you are getting a product you can also use, you should check the diameter of your motorcycle’s handlebars and then match it to the size in the unit’s sizing guide. Most models in this line are adjustable, but you still need to make sure that it can fit your ride so that you won’t waste money by purchasing the wrong product. The next thing you should check is the grip type and the reliability of the product. The items in this line come with a variety of grips such as Finger Grip, X-Grip, and cases to hold your mobile device tightly in case of outdoor applications and bumps in the road. The design matters in providing a strong hold for your cell phone. Most types of mounts are equipped with clamps that are used to install the unit to the handlebar. We recommend getting the largest clamp you can find, but make sure it is compatible with your motorcycle to be able to install it securely. 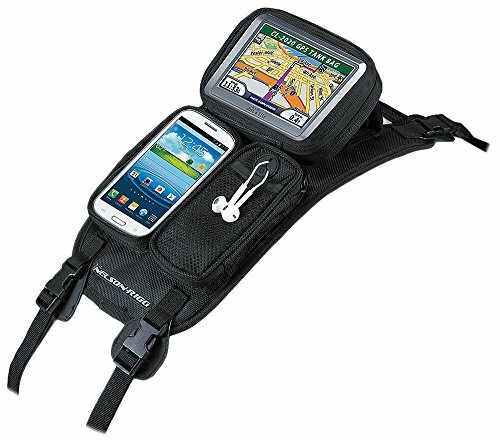 We definitely recommend going for a waterproof motorcycle phone mount if you are constantly on the road. You never know when you can be caught in the rain, so it is best to protect your belongings. A motorcycle phone mount with charger can also be a good option, especially for long rides, when you are also using the GPS function which drains the battery of the smart device fast. Of course, you also have the option of buying a motorcycle USB charger separately. 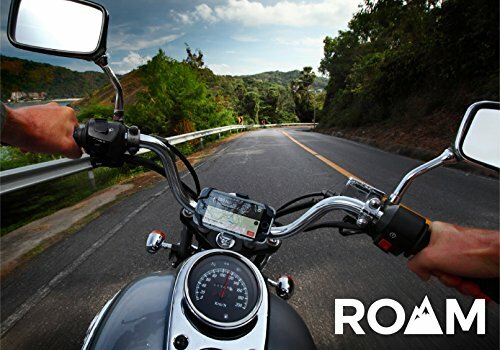 In case you do not want to use your phone for this, there are many motorcycle GPS units as well, but this is entirely up to you and your budget. The 360-degree rotation feature is something else you can look for. It will allow your phone to tilt at any angle you prefer. Since we have mentioned mobile device security, surely you do not want yours to get damaged by the holder. Many phone mounts come with scratch protection, so we recommend looking for this feature. Shock absorption capability is also essential for outdoor applications, high speeds, and bumps in the road, which might damage your device. Since time is precious, you probably prefer uncomplicated devices. For example, we recommend looking for a phone mount that is easy to install and which does not require special tools for this process. Not all of us have technical skills or even complex tool kits at home. And surely there is no point in paying more to have a specialist do this for you when there are so many models out there that you can install without technical knowledge or instruments. After placing the kit on your bike, it is best to be able to attach and detach the device easily. It can become quite frustrating to waste a lot of time trying to get the device out from the cradle. That is why we recommend mounts that require one hand usage and the least amount of movements for this process. If you follow the recommendations that we have provided in this guide, we are sure you are going to be able to pick the most appropriate product for your needs. And since we talked about accessories for motorcycles, you might also like to read our article about the Bluetooth motorcycle headset. Or, you might also be interested in finding more about motorcycle radios, or even about the motorcycle cup holders available nowadays.